Background: Urine is a common biological sample to monitor recent drug exposure, and oral fluid is an alternative matrix of increasing interest in clinical and forensic toxicology. Limited data are available about oral fluid vs. urine drug disposition, especially for synthetic cannabinoids. Objective: To compare urine and oral fluid as biological matrices to monitor recent drug exposure among HIV-infected homeless individuals. Methods: Seventy matched urine and oral fluid samples were collected from 13 participants. Cannabis, amphetamines, benzodiazepines, cocaine and opiates were analyzed in urine by the enzyme-multipliedimmunoassay- technique and in oral fluid by liquid chromatography tandem mass spectrometry (LCMSMS). Eleven synthetic cannabinoids were analyzed in urine and in oral fluid by LC-MSMS. Results: Five oral fluid samples were positive for AB-FUBINACA. In urine, 4 samples tested positive for synthetic cannabinoids PB-22, 5-Fluoro-PB-22, AB-FUBINACA, and metabolites UR-144 5-pentanoic acid and UR-144 4-hydroxypentyl. In only one case, oral fluid and urine results matched, both specimens being AB-FUBINACA positive. For cannabis, 40 samples tested positive in urine and 30 in oral fluid (85.7% match). For cocaine, 37 urine and 52 oral fluid samples were positive (75.7% match). Twenty-four urine samples were positive for opiates, and 25 in oral fluid (81.4% match). For benzodiazepines, 23 samples were positive in urine and 25 in oral fluid (85.7% match). Conclusion/Discussion: These results offer new information about drugs disposition between urine and oral fluid. Oral fluid is a good alternative matrix to urine for monitoring cannabis, cocaine, opiates and benzodiazepines recent use; however, synthetic cannabinoids showed mixed results. Keywords: Benzodiazepines, cannabis, cocaine, opiates, oral fluid, synthetic cannabinoids, urine. Keywords:Benzodiazepines, cannabis, cocaine, opiates, oral fluid, synthetic cannabinoids, urine. Abstract:Background: Urine is a common biological sample to monitor recent drug exposure, and oral fluid is an alternative matrix of increasing interest in clinical and forensic toxicology. 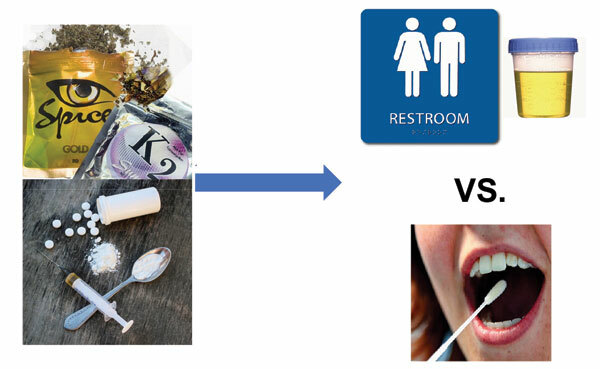 Limited data are available about oral fluid vs. urine drug disposition, especially for synthetic cannabinoids.